EM & me . . .
yesterday, May 16 . . was the day Emily died – in 1886, at her home in Amherst. the Ghost – is in the room !!!!! besides the current exhibit on Emily Dickinson, ‘I’m Nobody! Who are You?’ at the Morgan Library, up only til the end of the month / don’t miss it. 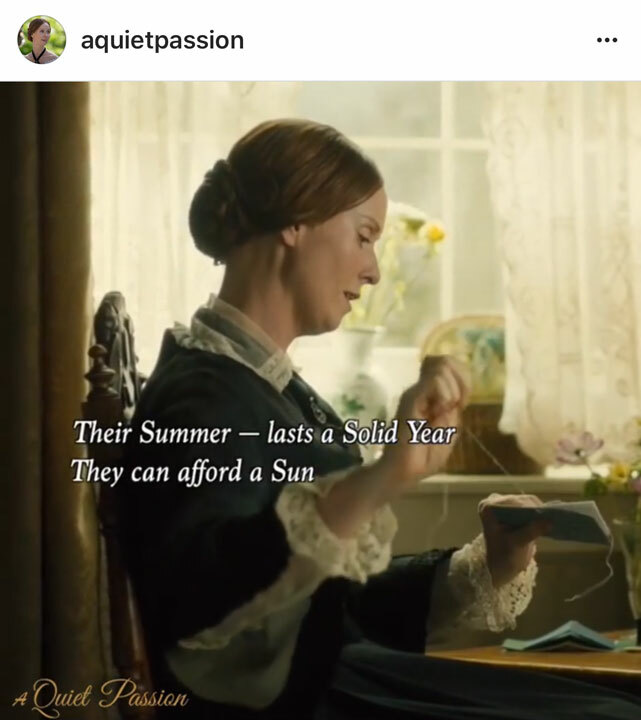 a feature length film . . on EMILY DICKINSON, titled, ‘A Quiet Passion’ / opened last week, here in NYC. between the two of them / one can begin begin to feel closer to the austere Emily. her times, her family and friends, her upbringing, and her life’s work . . with each endeavor, the museum show and the feature length film – dovetailing with the other, to fill in the blanks. at the Quad Cinema . . here in NYC. unlike the press I saw online just now, I would say, no – it is not a brilliant blockbuster, lordy. what-ever . . are they thinking ? those with stressed-out jobs in, say . . the fashion world, who are just dying to veg-out on a pretty & yet informative / sensitive & delicately . . spaced-out 2 hour, period docu-drama, with . . good costumes. the various, period-correct / hand-tatted lace collars, seem to be authentic museum pieces ?!!! did somebody say: passion, albeit . . quiet ? while of course, wouldn’t you know: EMILY and his proper wife, SUSAN . . were best friends. it gets even more complicated by the evil woman Mabel’s apparent utmost devotion to Emily’s poetry, if not to Emily herself, but who really knows ? . . turns out, it was MABEL who first edited, preserved and published Emily’s poems, after her death !! and a most interesting facet of the whole tale – and which is more fully addressed in the Morgan Library exhibit. and, in fact not mentioned here at all. the publishing. the devotion to Emily’s work. instead, this film’s focus, is to try / to fill us in on, cinematic-ally . . on how hard it was, for the contrarian Emily, so rebellious, and yet in her own way / so very rigid . . to come to terms with her brother’s absolute flaunting of convention / to live and to work . . amidst a very complicated betrayal of her life, on all levels. it’s a long meandering road, but we do get . . how Emily’s stubborn, questioning & contrary views – the depth of which gave rise to her inward / haunting voice, and which followed closely nevertheless upon the strict & repressed Protestant / Puritanical upbringing she had been raised in; and whose conventional practices she upturns & questions at all turns . .
and which clearly has its own individualist / stubborn yet undeniably ‘passionate’ set of narrow beliefs, . . how that ‘QUESTIONING’ . . . is thrown right back at her, to rationalize and ask her to accept Austin’s deviant behavior. as in: doesn’t everyone have a right to find their own path, passion, and way / and, most importantly to ber to be . . forgiven ? there is some gentle alluding – to the fact that the long suffering wife, Susan . . might be lacking in the passion department / or else, ‘why did she resist Austin’s proposals of marriage – so many times ‘? there’s also some ‘alluding’ to some ‘acceptable’ veneer for the affair; as to the fact that ‘Mabel’s husband might be compromised by . . venerality’/ or, as we say . . std / and in those days, it was quite a devastating situation, re final solution ‘surgery’. at any rate, unlike the Morgan museum exhibit, which keeps a petty tight pace attuned to the intellectual & ‘literati-life’ / whirl of passion, that complicated Emily’s life, and I guess made her akin to a contemporary reality star – in her own little village, no ? ‘A Quiet Passion’ . . treats us to a physical, lustful . . . scene of Emily actually walking in on Austin and Mable, getting it on, while innocently on the way to the kitchen – for a midnight snack !!! you know, and then all that Protestant – faith questioning /comes on-board / so you see them all argue it out – from both sides of the ‘righteous’ ledger / or any side, actually. back & forth endlessly !! one thing’s for sure, Mabel does not get kicked out. but, my question is: is it ever directly addressed in the poems, or in any of the huge correspondence she is supposed to have kept up ? how Emily felt about this affair ? what was the low-down ? what’s in the real . . archive / and, what was . . re-imagined by these filmmakers ? a poem is narrated overhead, after the ‘outing’, to the effect that: ‘why has my world spun out of my control’ ?!! I don’t think there is much mention, either on paper, in letters or diaries / or at least in ones that haven’t been long burnt (!!) by now . . . because there’s absolutely no portrayal in this film, on how that relationship / the between Emily and her brother’s mistress, Mable – evolved over the years. though it seems it did, re the Morgan exhibit. and that’s one reason I would like to read the poems – now. searching for references . . to the ‘goings-on’ / between the . . lines !! though, that’s where the Morgan Library pipes in again, letting you know how MABLE was a big fan of Emily’s work, and sent her letters, and Emily sent her poems. in fact, it was red letter ‘Capital A’ MABEL LOOMIS TODD, and not wife/ friend Susan, who was to publish Emily’s poems after her death . .
the Morgan does give us some tantalizing facts, but with very little emotional detailing. again, I guess none exists on record ? but still, who knew . .
all along . . confounding & confusing her ???? no wonder, she looked so outward for order – in the world. but the singular, most important aspect of this film, and one that fills in a big void at the Morgan exhibit, is not an emotional ‘coloring’, of her life, but an actual . . DEMONSTRATION !! of EMILY, at work on her famous ‘fascicles’ / or hand-sewn tiny packets of poems, small folded paper pages stitched together / or, in other words . . as we would say today, DO-IT-YOURSELF-BOUND !! at the ‘spine’, or fold. although the Morgan exhibit speaks of these ‘fascicles’, or ‘packets’ – there are no photos or reproductions, let alone a precious archival one. turns out Mabel, who actually gave the name ‘fascicle’ to these little hand-sewn packages of poems, and the other early editors . . dismantled them !! wow, that’s a whole other story, somebody else – has to write. 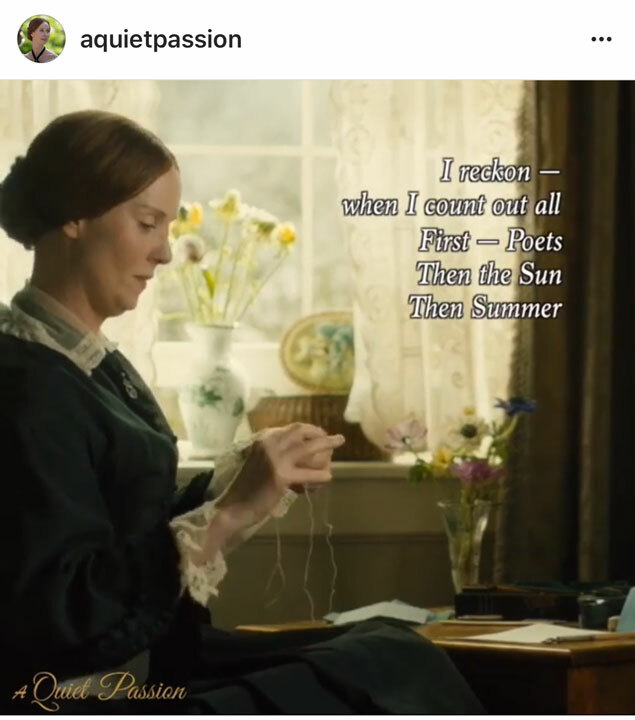 A quiet passion . . ? CYNTHIA NIXON, as a pretty good, very believable . . EMILY DICKINSON, first stabs a few holes, clear through a few leafs of folded paper, upon which she has scribbled her poems / to ready them for hand-stitched sewn binding, or DIY, as we would term it today !! and that’s another reason, Dickinson is seeing a sudden revival, & relevance today. her shaped pages, scraps, collages . . and DIY binding !! are allowing us to see her / through the magic of modern digital / photographic reproduction, not just the old typeset printing of yore, as the singular poet – artist / she really was !! the times, they just be a-catching up . . to her. Emily pulls the thread – through the holes, to hand-bind the tiny books into packets, the easier to store the poems. or . . what we would call today, self-published ZINES !!!!!!! 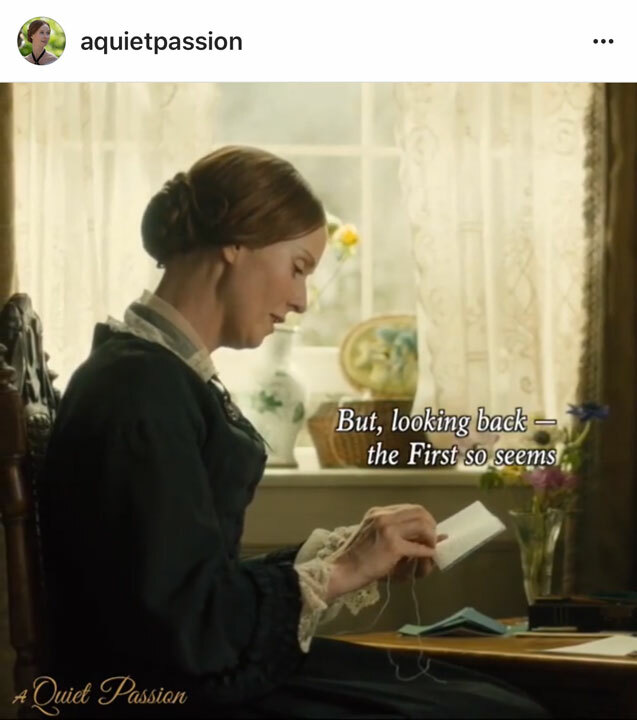 a priceless moment in the film . . ‘A Quiet passion’. EMILY stitches . . a hand-bound – ‘fascicle’. you can see how good CYNTHIA NIXON is, too. that although, as the Morgan gets it . . Emily is now being seen through new eyes as a poet-artist, and they, the filmmakers . . did make a point of re-creating this well-informed scene of her hand-binding her little books, and it’s produced so well, and so lovingly . . .
the footage doesn’t make the . . commercial trailer ??? I guess they forget, that in the end, probably . . it would be only artists and writers, in effect the scholars . . who know, and are desperate for this kind of historical detail / that would be the ones who would be watching the trailer, and they should have included it. they should not never have dumb-ed it down, for the masses. a ‘Hallmark’ film, despite the illicit affair – this is, not. a cross-over film / this is . . not !! why not revel in what it – is. it definitely has its moments.